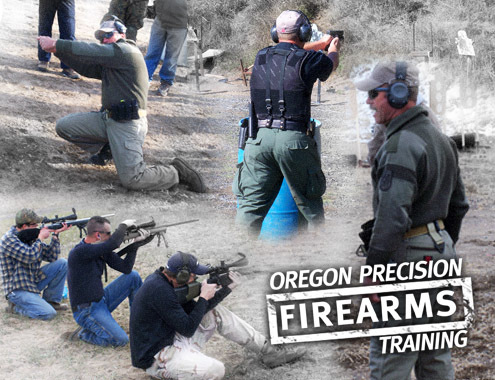 Oregon Precision Firearms Training is Central Oregon's premier weapons instruction facility. We specialize in Carbine, Pistol, and Long-Range Precision Rifle with multiple concentrations and variations in each. We guarantee that our classes are the best bang for the buck you'll find! We also offer private courses to meet your training and scheduling needs. Our courses can be scheduled at a range near you, or at any suitable location. Contact us to discuss or flexible options! Our class list is now up. Check the Calendar to see what we are offering this year. ShooterReviews.com has posted an excellent review of our Defensive Pistol and Precision Rifle classes! Be sure to check them out! To register for any of the above courses, view fill out the application form. We also offer private courses to meet your training and scheduling needs. We can bring our courses to your location or a range near you. Contact us to discuss or flexible options!